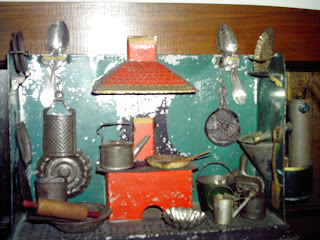 This tin kitchen playset dates from the mid to late 1800s. It was made in America, and represents a much simpler version of the fabulous German Nuremberg kitchens of the time. The kitchen measures about 12 inches wide by 8 inches tall, and most of the accessories are original to the set. One of its most interesting features is the water pump on the right side. It could actually be filled with water and then pumped into the sink fixed to the wall. These kitchens were not meant to be true to scale; rather, the idea was for little girls to learn cooking by playing with them, and for that they needed larger utensils. These tin kitchens were used for "cold cooking" (pretend), but there were also woodburning and alcohol stoves made for "hot cooking" (real). I'll list some of these 19th century versions of the Easy Bake Oven soon! It's spring, which means it's time for the gardening gnome to get busy. 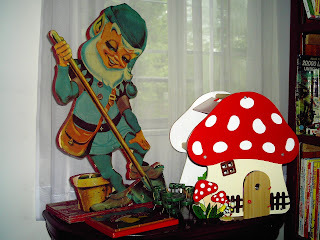 This wooden cutout gnome was used in holiday window displays at the downtown Detroit Hudson's store in the 1930s. He's about a yard tall, and likes to hang out next to the mushroom dollhouse. 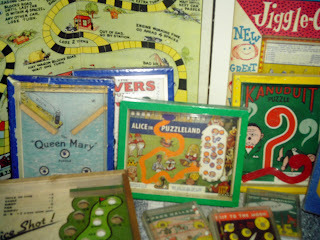 I'm somewhat obsessed with collecting old dexterity games. They're like fascinating little worlds behind their glass or plastic windows, they often feature beautiful lithography, and they're just fun to play, too. Here's a small portion of my collection. 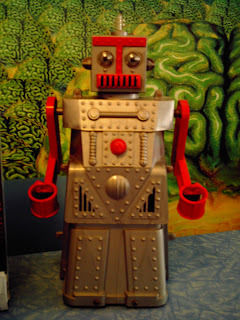 From the 1960s, the Mr. Potato Head Picnic Pals! Mr. Potato Head has led a very sociable lifestyle. Besides the Mrs. and the tots, he's had a lot of friends. These are some of the hardest to find. They were typically sold in sets of 3 consisting of Mr. Potato Head, a "main character" Picnic Pal, and a condiment or side. From left to right: Frankie Frank, Mr. Mustard Head, Mrs. Ketchup Head, Frenchy Fry, and Mr. Soda Pop Head. Sadly, I am still looking for the final Picnic Pal: Willy Burger. 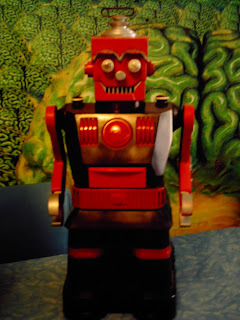 , This antique printer's tray full of small old toys sits on my coffee table. Everyone who visits tends to gravitate toward it: its pull is seemingly irresistable. The tiny compartments are filled with vintage Cracker Jack and gumball machine prizes, antique china dolls, miniature figures, toy trains and playsets, miniscule books, and lots more.